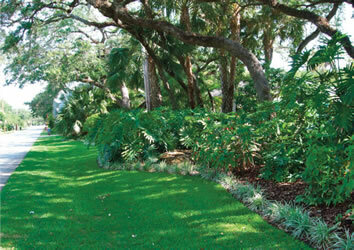 As expansive as this lawn appears, grass represents less than 40% of the total landscape. First, consider that every designer’s endeavor should have a specific purpose in mind. Then that designer must set a firm goal to fulfill that design projects purpose and move to establish the means and activities that will activate the purpose as envisioned. In this article we will establish our purpose to adopt and adapt an existing landscape and take design steps to transform its gardens into a more environmentally responsible landscape. In this discussion, we are setting the goal to create a garden that meets most of the requirements that will allow a landscape to help acquire a LEED certification for a project. LEED is an internationally recognized green building certification system which provides third-party verification that a building or community was designed and built using strategies aimed at increasing performance, reducing waste, and improving quality of life. The LEED designation is made up of the letters from “Leadership in Energy and Environmental Design” and was developed by the U. S. Green Building Council (USGBC), which is a non-profit organization dedicated to sustainable building design and construction. It is this organization that will issue a LEED certification for those wishing to acquire one. We highly suggest that those wishing to do so visit their web site at www.usgbc.org in order to acquire the information required to be awarded that certification. We also suggest that you contract with a LEED professional consultant in your area that will be able to assist you in this regard. But thinking in practical terms, how does someone produce a sustainably built house and garden that is energy independent? And then, how do you carry that thinking further and attempt to create an overall project that will be considerate in the use of resources required to maintain that project site? 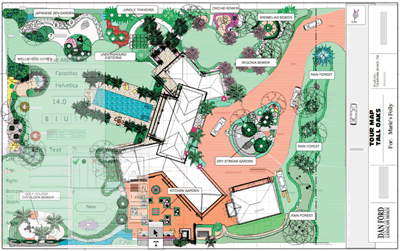 The Plan: This Tour Plan indicates the concept of the landscape design that features various destination gardens that have various garden themes for viewing and horticultural enjoyment. 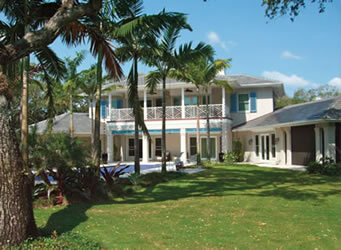 All garden elements were conceived and implemented with consideration of LEED’s environmentally responsible parameters. This writer will leave an explanation of the complexities of transforming a house into a modern, energy efficient building to others. Our goal here is to describe what it will take to have the best possible landscaped environment, and herein present a short overview of how to achieve a beautiful landscape and still stay within the environmentally positive parameters that a LEED program will help establish. But first, let us consider the goal for creating these gardens. For purposes of establishing a vision that the reader can follow to better understand the subject, we are describing the design steps that we have used for a previous client that acquired a LEED Gold certification. In this project our client was fond of all garden venues and that makes it difficult to choose one specific garden theme over another. Next this client loved to entertain friends and feels that a wonderful aspect of entertainment is to have that activity occur outside as well as inside the house. This led us to incorporate destination gardens within the landscape. These destination gardens are specifically themed green enclosures that we called “Bowers”. Bowers are often thought of as nests or habitats for birds and that can be true as well. But in actuality bowers are “leafy shelters” and that is certainly what they are within this envisioned landscape. Entry Under The Oaks: The existing majestic oaks on this property have all been saved and protected from excessive wear and abuse over their root system. 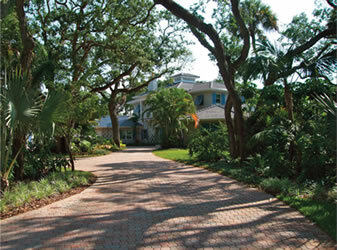 The driveway passing under the oak canopy is designed of sand set concrete pavers that allow water to move over and through the driveway system. 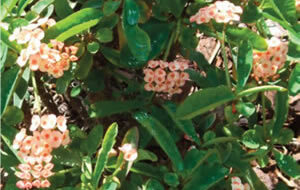 Some of these destination bowers are places where begonias will rule, while other bowers will display and cultivate orchids, while yet another destination might feature bromeliads or ferns. Our client wanted these gardens within a garden to be landscaped delights that she could take on as projects to be developed over time and within a time frame that she has to devote to making them perfect spots to work or meditate within. The street side swale captures surface water from the lot and delivers it to community drains and underground gutters. The vegetative perimeter shown is a new rain forest environment that provides a visual and auditory barrier between the street and the house environs. There are underground moisture sensors that keep the irrigation system shut off until sprinkling is needed. Other destinations are a Japanese Zen Garden and a Kitchen Garden where our client would be able to grow flowers to cut or edibles such as herbs and vegetables to cultivate. There are also bamboo gardens and lush tropical perimeters planned all about. At the driveway court we proposed a dry-stream bed flowing under a beautiful footbridge and surrounded by various tropical and unique collector plants. Areas will be designated to introduce sculptures and other garden art as time goes by and as our client collects them during her travels. This garden will never be complete, as gardens never are, so there is no hurry to rush all the wonderful touches that will ultimately be added over the years. As you can see, these desirable goals don’t fit easily into the normal vision of “conservation” gardens, which are often visualized as a minimalist landscape with a limited palette of native or desert like plants, but this is where the concept of “Environmentally Responsible Landscaping” comes into play. 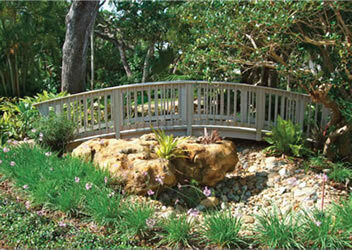 This footbridge spans a dry streambed that provides a visual aspect of a watercourse without the need to expend resources and energy to maintain a continually flowering water feature. Now, back to the rationale about making all of these green things really “Green”. This is a complex idea and hard to define but there is a way we can approach it and we did. First, we know that we did not want to create a garden that is the driest, most maintenance free garden possible as our client places a high value on aesthetics and this minimalist approach is not appealing to many people. So rather than being purists on low maintenance, we decided to be sensible in that regard. 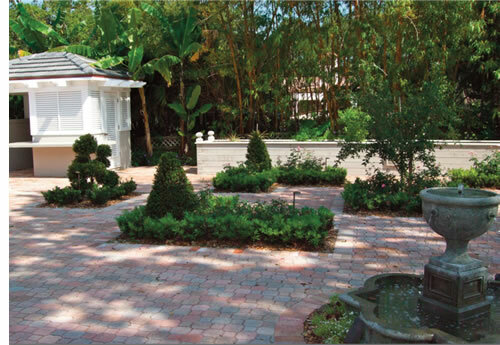 There is a landscape design standard called Xeriscape and we followed many of the principals of that design discipline which is primarily to be thrifty with water and minimalist when considering the use of fertilizer and insecticides. 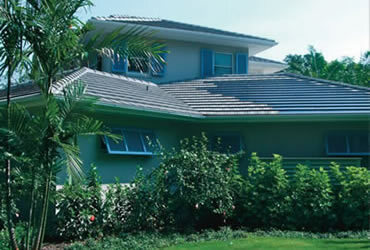 This expansive roof structure contains solar collectors incorporated within the roof tiles on the south and west faces of the roof. This system allows the residence to generate much of it’s own power and even allows excess electricity to be sold back to the local power authority grid. First, we targeted the amount of drought tolerant grass to be less than 50% of the total landscaped area, as grass requires the most water, food, insecticides and maintenance energy. In actuality we reduced the final amount to less than 40% of the total by using large areas of very drought tolerant ground covers in shady areas or where grass was not essential to the design. It is certainly possible to further reduce that amount, but most people like a reasonable amount of grassed area and some communities require a minimal amount in order to present a traditional neighborhood aesthetic of manicured lawns. We also used as many varieties of native plant materials as we could and still keep the targeted design integrity intact. Native plants are good selections for ease of maintenance, but some exotics are even better and we used them when we could. 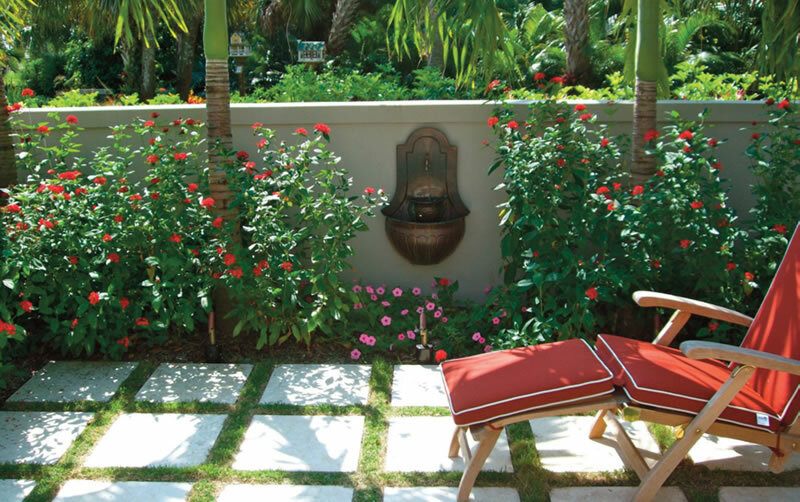 However, this client also loves plants such as hibiscus, bougainvillea, heliconia and many others varieties that are not generally considered eligible for a Xeriscape style of garden. We grouped these relatively needy plants together in compatible garden beds where their needs could be met without impacting the larger garden environment. We must acknowledge that most clients desire garden elements that appeal to their sense of a beautiful garden even when they don’t qualify as minimalist in their cultural needs. If we don’t incorporate those elements into their garden designs, we won’t be able to encourage client’s to take an “Environmentally Responsible Landscaping” stance on the rest of the total landscape concept. The net result benefits the environment even greater because more of the community will sign on to such an environmental strategy. This Japanese Zen Garden is a major destination in the landscape and is decorated with sand, rocks, and other natural materials in lines or patterns to create a meditative environment. This "Bower" garden will eventually be used to display orchids and bromeliads. The benches used in all these "Bowers" have been crafted from timbers rescued from a portion of the original building that was razed preparatory to the renovation of that building. As excessive water use is one of the highest negatives in a “Green” garden, we decided to tackle that issue head on. Over 80% of our chosen vegetation is considered drought tolerant and that is good for a start, and we placed plantings with the same irrigation needs within common beds in order to attend to specific moisture needs more easily. Our client made some hard decisions to put money where her beliefs are and opted to invest in large underground cisterns that would collect rainwater from the gutters and other rain collectors. This rainwater harvesting system water is then used to irrigate the plantings. The primary landscape irrigation water comes from wells and draws from the underground aquifers to refill the cisterns when the collected rainwater is depleted. As far as sprinkler system design goes, all of our high efficiency irrigation system is of the latest technology for saving water use, including the use of low volume sprinkler heads and drip irrigation where practical. In addition to an above ground moisture sensor that shuts the irrigation system down after adequate rainfall, we even used undersoil moisture sensors in our tropical “Rain Forest” areas to measure when that soil has retained adequate moisture and thereby automatically turn that particular sprinkler zone off until the area it controls needs it. We also implemented an irrigation management program that further reduces excessive usage of water. This management program avoids the typical situation of setting an irrigation system to automatically water the gardens and then forget about it after that. We encourage the client and grounds maintenance personnel to actively and constantly watch the garden and attend to its needs rather than trusting an automatic system to do this function. This practice saves resources and benefits the plantings as well. There are other major landscape concerns that affect the overall environmental status of a project. Some of these are erosion control, surface storm water runoff directives, allowing no invasive plants within the plan and these don’t even include eliminating any visual and auditory toxicity that emanates from within or from outside the project site. In summary, take your time to perform a proper due diligence when assessing your landscape site for problems to be solved and solutions to be effected when attempting to create any design, but particularly when attempting to be "Environmentally Responsible", and above all perform all those functions without being obvious about it. A garden, after all should be a thing of beauty with an environment to be enjoyed and treasured. 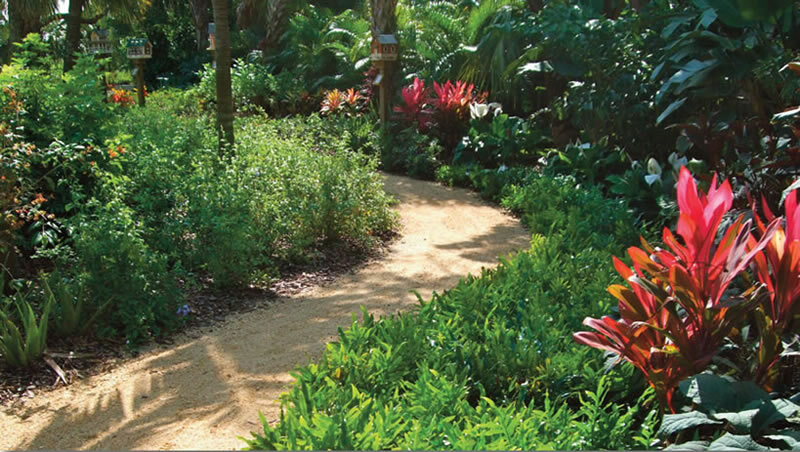 The “Jungle Traverse” is a pathway constructed of compacted local sand and seashell that hardens to provide a natural traverse through lush gardens composed of native and exotic plantings arranged in culturally compatible beds. 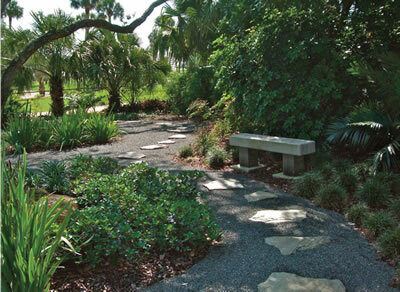 The small seashells migrate to the top of the pathway and create a very pleasing appearance. Other features to be found along the "Jungle Traverse" are birdhouses that are also crafted works of art. These houses represent historical houses of note and in this case are buildings of the south. This is a great way to please the birds and the bird watchers alike. 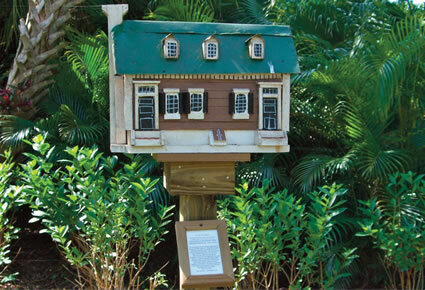 This is a close up of a birdhouse that represents the Hugh Mercer Apothecary Shop in Fredericksburg, Va., from the 1750s. 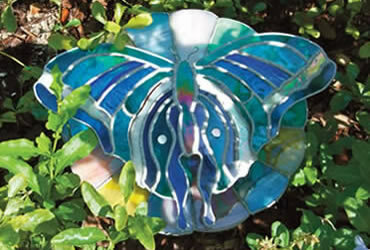 This stained glass butterfly was designed and crafted by Larry Bland who also designed the complex sprinkler system that waters groups of plantings in the most efficient manner possible. The butterfly is embedded in the underground water storage cisterns and rises or falls as the level of water stored in the cisterns changes. 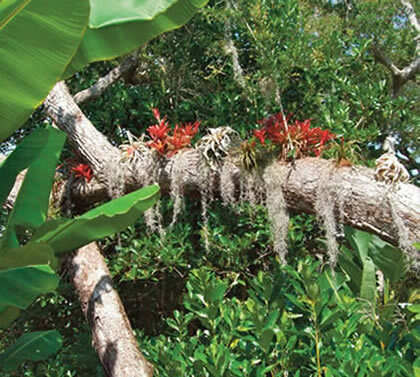 Orchids and bromeliads are mounted on tree limbs and often irrigated by a drip line system delivered to the plantings. 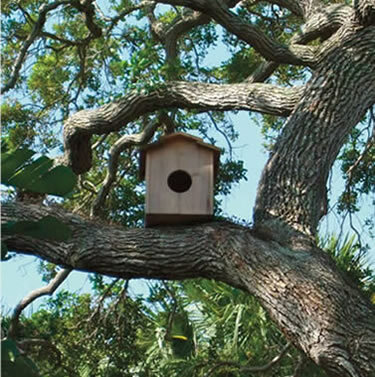 Speaking of housing, this nesting box is specifically built to house a barn owl whose responsibility it is to keep the population of snakes and rodents to a minimum throughout the grounds. One is in the rear yard and one in the front. This is a great way to avoid poisons and traps. This bedroom courtyard has grass strips that visually “cool” the terrace. These grass strips are irrigated by drip irrigation that uses less water and keeps any rust that appears in the water from appearing on the paved surface. 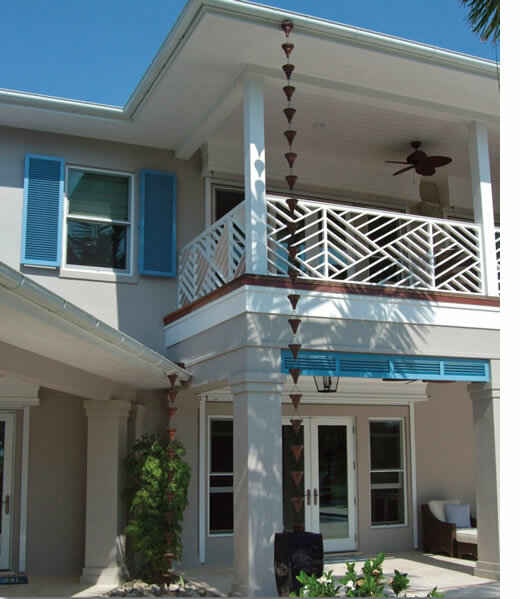 The entire roofline has a gutter that collects rainwater and directs it towards rain chain that carry that water into receptacles at various junctures surrounding the house. The water leaves those receptacles and travels in underground pipes into large underground storage cisterns that will supply water for the sprinkler system. 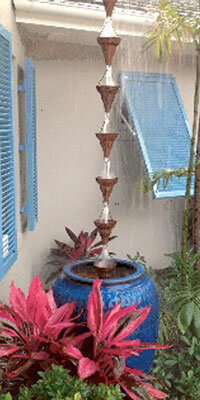 This is an example of the rain chain at play, with the water cascading into a decorative container with an overflow inside that will send the water underground to the cisterns for storage or sprinkler use. This kitchen garden is composed of sand set pavers and planting forms bordered and accented by drought tolerant plants. Fills planted inside these planting forms and within the elevated planter might be cutting flowers, herbs, vegetables or other interesting selections. Irrigation of these fillers is generally by the gardener rather than an automatic system.